Mum made kifli the other day. So I thought I’d photograph the event and share it with you all. 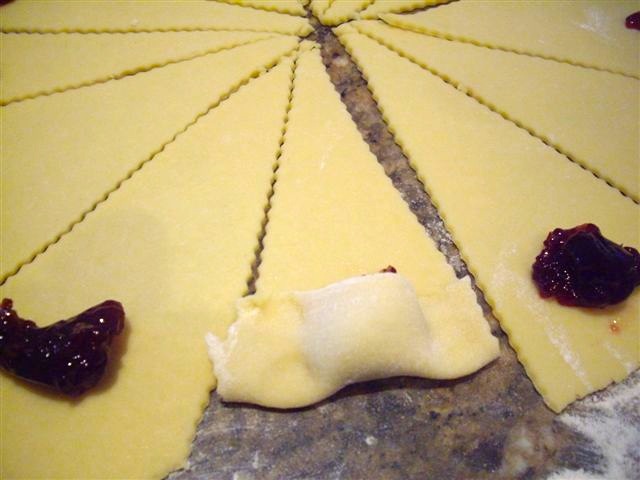 Kifli is an Eastern European sweet treat that is made by rolling biscuit dough over a dollop of jam. These little crescent delights are not exclusively Croatian, as my research uncovered, but this here is a Croatian recipe given to my mum . These biscuits are so good they disappear from any kitchen bench in record time. I remember having friends from school over who would look at these biscuits in curiosity and go on to eat their fair share! My whole family truly loves these biscuits, and I am lucky enough that my mum is still motivated enough to bake these wonderful treats for everyone. I have not yet attempted this recipe…and don’t anticipate I will have to as long as mum is there to spoil us all! Mix softened butter with sour cream and beat in eggs. Add sugar and flour, mix well. When combined, put out on a floured bench and knead for a few minutes, so it all comes together nicely. Roll into a log shape and cut into 5 equal pieces. Roll each one out like a pizza, about a 1/4 inch thick (about 5mm). 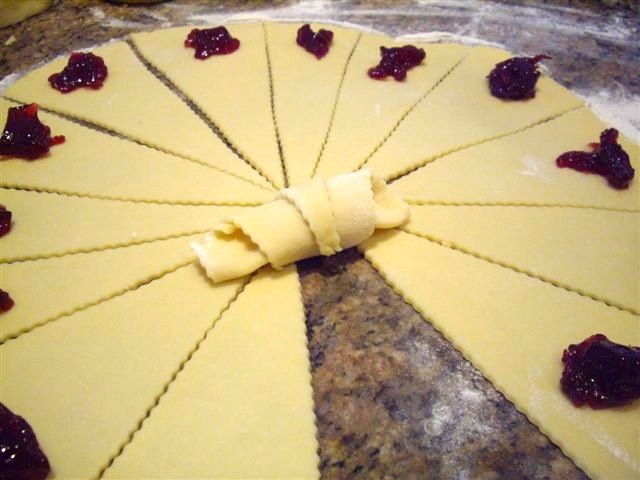 Place a tsp of jam on the thick edge of the wedge and roll up. 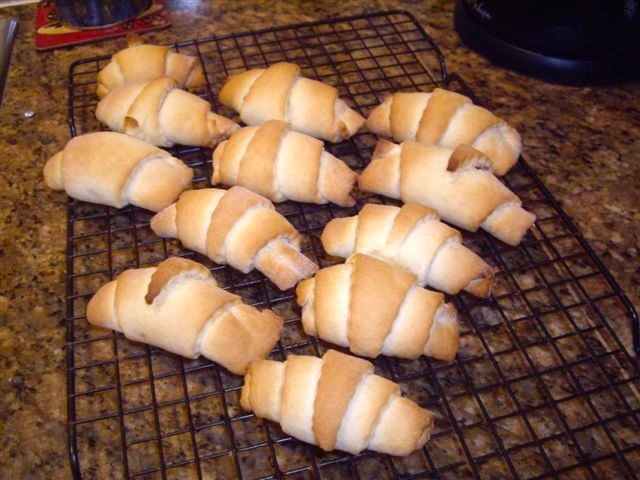 I was surprised to read a recipe for Kifli on your blog. Isn’t this Hungarian? The reason that I ask is because I am looking for authentic Hungarian recipes that I can put into a binder that I can give to my daughter as a gift before I am gone. I want her to understand her Hungarian Heritage and have a rememberance of me. Could you help me? Thanks for your time. Ohhh Lara I love these!!! These are classic! 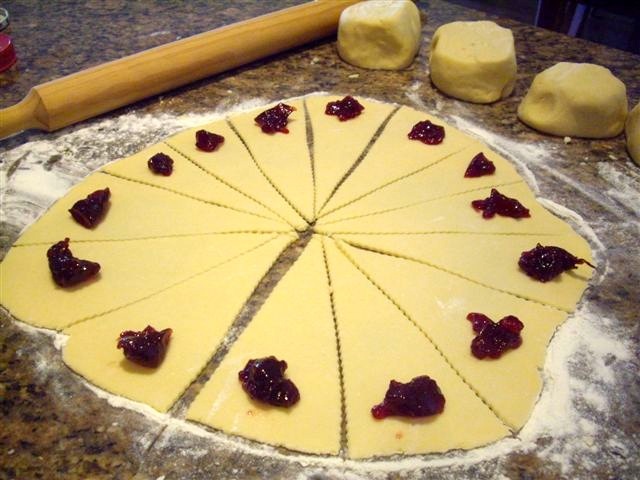 My mom would always make plum jam and walnut kifli. She would keep the jam kifli straight, but curve the walnut kifli like a horseshoe so you could tell one from the other. Of course, jam never lasted very long! My husband’s grandmother makes one with shredded apples that are stewed to an almost jam like consistency – these are pure heaven! Lovely blog, I’ll be visitng frequently!